Of course, we hope it will never happen to your brand. But the truth is, since the outburst of social media there have been thousands of businesses, both small and gigantic ones, that have suffered from a social media crisis. Some handled it well, some made it so much worse, some ruined their brand forever. Even though the last ones obviously deserved it. So here is a quick prep list for what to do before the possible crisis and when/if the dark hour comes. You know everyone says that. Don’t cure — prevent. Have a plan. Be prepared. In reality, it’s hard. The very definition of a crisis implies that you were not prepared for it to happen. But it doesn't hurt to go through at least some preparation. The relatively quick and easy bits at least. Who will handle your social media accounts in case of a crisis? What will that person be authorised to write on social media? Will they need approval for every post? Besides, make sure that all passwords to your social media accounts are readily accessible to the ones responsible for handling a crisis. This is the first and most important thing you should be doing. Before you burn me on a stick for being too promotional, listen: you can’t possibly handle a crisis you are not aware of. It can happen on every relatively big social media site. Not only Twitter and Facebook, not only the sites you are marketing on. Moreover, the flame can appear on someone’s blog, on some local news site - anywhere. And if you only find out about the crisis when it has been re-posted on Twitter/Facebook - you are too late. So do choose a tool like Awario - one that monitors everything. 3. Know what is and isn't a crisis. There are three characteristics of a social media crisis. a) Information asymmetry - when the public knows more about what's going on than you do. b) A decisive change from the norm. Many brands are criticised harshly, but routinely: McDonald's for increasing world's obesity, Apple for labour practices, Victoria's Secret for employing borderline anorexic models. This is all horrible, but not critical. The second sign of the crises means a different, unexpected line of criticism. c) A potentially material impact on the company overall. It is the scale of the problem that constitutes the third sign of a crisis. Forgetting to get a table at a restaurant reserved for your client isn't a crisis. Horse meat in your burgers is. After you've decided you are facing a crisis, monitor how it develops. Is the issue getting more visible or less? Are there any people with a large influence involved? Respond fast. Responding in more than 24 hours after the breakdown may cause serious damage to your company. Acknowledge the crisis. Let people know you are aware it has happened. If you don't have enough information to reassure the public, let them know you are looking into the matter. Update them with every new piece of information. If the crisis has been caused internally, the CEO should take full responsibility for the issue in a public statement. A statement must show compassion and their full commitment to the issue. It should be posted on the original platform (where the crisis broke down), and then re-posted to others. If the crisis has been caused by an offensive online post/comment, make sure to delete it. However, don't delete (and that is crucial) any of the public comments, nor any re-posts of the original statement. By deleting your company's offensive post you are showing respect and understanding, not trying to hide the fact. If possible, respond directly to anyone directly affected by the crisis immediately. However, avoid "stock" responses - they irritate the public more than they help. Social media crises are harsh, overwhelming, and hard to handle. Thousands of hateful comments, just and unjust, may hit you like a hurricane. It is extremely important not to fight back. Don’t be defensive, don’t justify your actions, don’t hide from criticism. Instead, your tone should be polite and humble. Contact information for real people at the company. Could the crisis have been avoided. An example from ASDA shows how to handle a social media crisis and not turn it into something bigger. On September 25th, 2013 ASDA, Britain's second biggest retailer owned by Walmart, decided it was a good idea to sell mental health patient fancy dress costumes for Halloween. The costume featured a torn blood stained shirt, fake blood, and a fake meat cleaver. The ad for it said: “Everyone will be running away from you in fear in this mental patient fancy dress costume” . You can sense the problem, right? Somehow they couldn't. Twitter exploded immediately with people accusing ASDA of being insensitive. Thousands shared stories of personal struggle with mental illness. It wasn't long before influential people, such as former footballer Stan Collymore, who has suffered from depression, joined the conversation. Within a couple of hours (outside of the working hours as angry tweeting started in the evening) ASDA withdrew the costume offer and posted a public apology (on Twitter first). In 10 minutes ASDA announced a solution that could make a crisis less damaging. Surely, the solution was costly (£25 000) but a viral campaign to boycott the retailer which often happens in such cases, would come at a greater cost. A viral campaign #mentalpatient still broke out the next day. 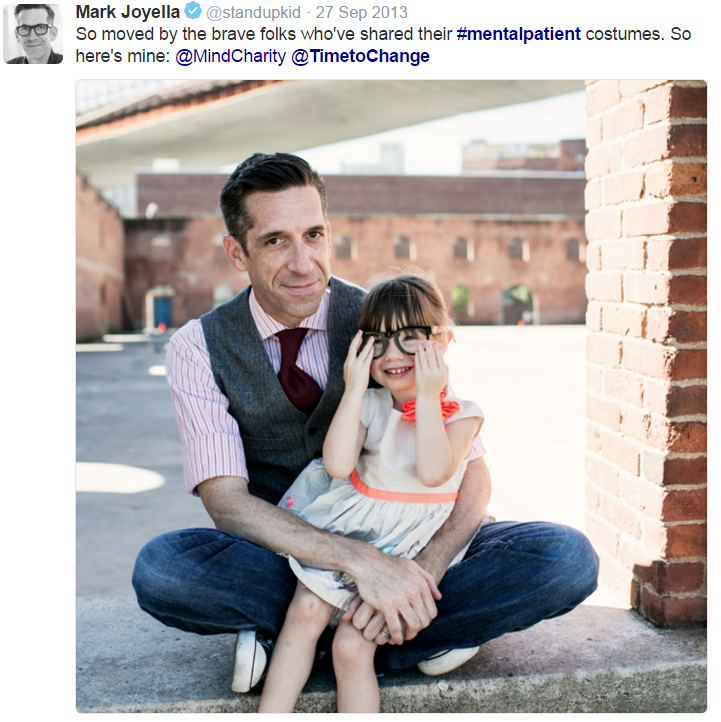 People diagnosed with mental illnesses posted photos of themselves dressed casually. However, due to ASDA's smart handling of the crisis, the campaign wasn't aimed at attacking the insensitive retailer. Rather, it was there to raise the mental health awareness in the general public. they acted quickly and humbly. This should be your most important lesson. Have you ever had a social media crisis? How did you resolve it? As usual, looking forward to your comments on the topic.